I hate to hear people say this Judge will vote so and so, because he is a Democrat -- and this one so and so because he is a Republican. It is shameful. The Judges have the Constitution for their guidance; they have no right to any politics save the politics of rigid right and justice when they are sitting in judgment upon the great matters that come before them. Congress did not make the Supreme Court, and doubtless it will transpire that it has about as much jurisdiction over its affairs as it has over the weather. The Court makes its own rules, and is entirely independent of Congress. Its custom is to decide by a majority vote, and if it chooses, will no doubt continue to do so. United States Supreme Court 1890. Photo by Napoleon Sarony. Courtesy Library of Congress. BACK ROW L-R: Samuel Blatchford, Lucius Lamar, Horace Gray, and David Brewer. 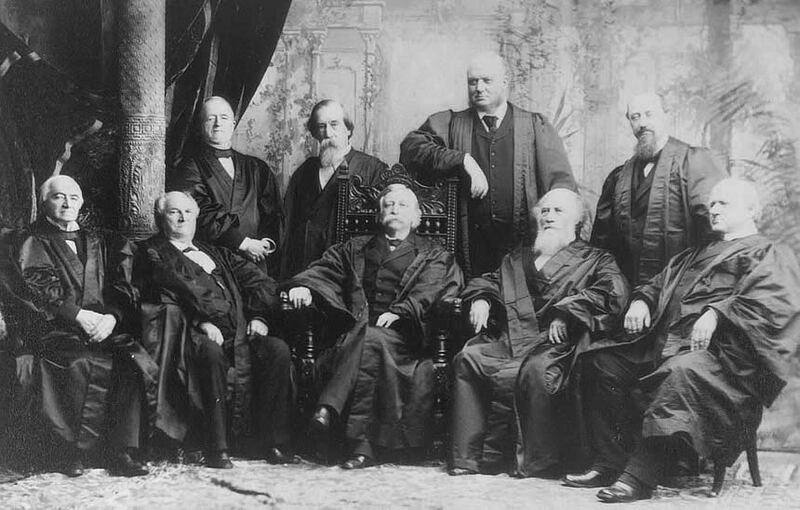 FRONT ROW L-R: Joseph P. Bradley, Samuel Miller, Chief Justice Melville Fuller (who was often mistaken for Mark Twain), Stephen J. Field, and John Harlan. A resolution was passed in the House, several days ago, to appoint a Committee to investigate certain charges which had been preferred in a six line newspaper item, against one of the Justices of the Supreme Court of the United States to the end that he might be impeached if such a course seemed justifiable. You will observe that the House not only so far forgot its dignity as to entertain that thing, coming in such unauthorized, anonymous, and altogether questionable shape, but discussed and acted upon it. Such conduct as this is ill advised, and is calculated to cheapen the respect due to this high tribunal. The impeachment of a Judge of the Supreme Court is a grave matter, and should have a more respectable foundation than town gossip. Hon. Stephen Field was the Judge referred to. It was stated in the newspaper item that he had said at a dinner where he was a guest, that the Reconstruction acts were unconstitutional, and that the Court would so decide them. Any man might have known that so absurd a charge as that, and one so out of all character, would prove utterly ground less, and such has been the result. If we had a party of chattering old maids on the bench, we might expect them to gad about their official business, but wise, dignified old men do not do such things. I have inquired about the matter, and find that the circumstances are not worth detailing. They are not particularly creditable to the gentleman from whom the newspaper man probably got his information, either.